If you are doing a flat panel front suit you can skip the pouch size as you will make “Flat Panel Front” for pouch size. Measure around the center of your hip bones below your bellybutton. Do NOT use your jean size for this measurement. Measure from the center of the crotch the desired top of the front of the pants. 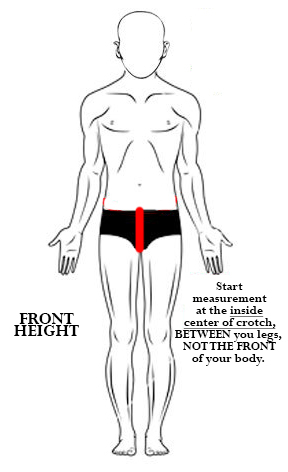 Measure from the center of the crotch to the desired top of back of pants. THIS SHOULD BE APPROXIMATELY 3 INCHES (7.6 cm) HIGHER THAN THE FRONT. Measure the desired cup size of the pouch (the outward curve). Lie down on the bed or the floor, and flaccid, measure from the left leg crease, across the “package,” to the other leg crease. That is your pouch WIDTH. Divide that by 2 for your pouch size.